The greatest improvement is in this. I.1.2 The effects of division of labour is carried furthest in very trifling manufactures. Trifling manufactures supply the small wants of a few people. It has a few workers. placed under the spectator’s view. Great manufactures supply the great wants of the population. It has so many workers that it is impossible to collect them all into the same workhouse. Thus in great manufactures, the work may be divided into more parts than in trifling manufactures. has been much less observed. I.1.3 An example of a very trifling manufacture is pin-making. has made pin-making a distinct trade. The invention of these was probably caused by the same division of labour. Certainly, he could not make 20. The whole work of pin-making is now a peculiar trade. It is divided into branches. Most of these branches are likewise peculiar trades. Making the head needs two or three distinct operations. Putting it on is a peculiar business. Whitening the pins is another. Put them into the paper is even a trade by itself. In this way, the important business of making a pin is divided into around 18 distinct operations. In some manufactories, all are performed by distinct hands. In others, the same man might perform two or three of them. I have seen a small manufactory of this kind where only 10 men were employed. Some of them performed two or three distinct operations. But they could make around 12 pounds of pins in a day. A pound has over 4,000 middle-sized pins. Therefore, those 10 persons could make over 48,000 pins in a day. Each person makes 10% of 48,000 pins or 4,800 pins per day. But if they worked separately and independently without being educated in pin-making, they certainly could have made 20 (0.4% of what they we capable of together) or one pin (0.02%) in a day individually. I.1.4 The effects of the division of labour in arts and manufactures are similar to their effects in this very trifling one. so much reduced to such simple operations. However, the division of labour creates a proportional increase in labour productivity in every art. The separation of trades arose from this productivity increase. This separation too is generally carried furthest in the most advanced countries. Generally, the work of one man in a rude state of society is the work of several men in an improved one. the farmer is generally just a farmer. the manufacturer is just a manufacturer. The labour needed to produce any complete manufacture is almost always divided among many hands. the dyers and dressers of the cloth! so complete a separation of one business from another, as in manufactures. It is impossible to entirely separate the grazier’s business from the corn-farmer’s business. But the carpenter’s trade is commonly separated from the smith’s trade. The spinner is almost always a distinct person from the weaver. But the ploughman, the harrower, the sower of the seed, and the reaper of the corn, are often the same. It is impossible for one man to be constantly employed in any agricultural work because they are seasonal. The improvement of productivity in agriculture does not always keep pace with the improvement of productivity in manufactures because of the impossibility of completely separating the branches of agricultural labour. The most opulent nations generally excel in agriculture and manufactures. But they are more distinguished by their manufacturing superiority. Their lands are generally better cultivated. They produce more relative to natural fertility of the ground, because of the increased labour and expence applied on them. But this superiority of produce is seldom much more than the superiority of labour and expence. In agriculture, the rich country’s labour is not always much more productive than that of the poor. At least, it is never much more productive as in manufactures. Therefore, a rich country’s corn will not always come cheaper than a poor country’s corn. Poland’s corn is as cheap as France’s corn of the same quality, despite France’s superior opulence and improvement. France’s corn in the corn provinces is usually nearly the same price with England’s corn of the same quality, even if France is poorer than England. However, England’s corn lands are better cultivated than those of France. France’s corn lands are much better cultivated than those of Poland. A poor country might be able to rival a rich country in the cheapness and quality of its corn. But it cannot compete in its manufactures, unless those manufactures suit the rich country’s soil, climate, and situation. France’s silks are better and cheaper than England’s silks because the silk manufacture does not suit England’s climate as well as that of France. But England’s hardware and coarse woollens are far superior to those of France. They are much cheaper with the same quality. In Poland, there are only coarse household manufactures which are needed locally. enable one man to do the work of many. I.1.6 First, the improvement of the worker’s dexterity increases the amount of the work he can perform. The division of labour reduces every man’s business to some simple operation. It makes this operation his sole life employment. It necessarily increases his dexterity. A common smith, who has never been used to make nails, will not be able to make over 300 bad quality nails in a day. 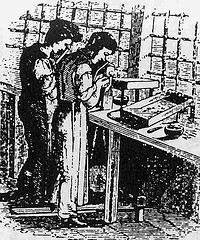 A smith who is used to making nails, but was not a nailer by trade, can seldom make more than 1,000 nails in a day with his utmost diligence. I have seen boys under 20 years old who where nailers by trade. They could make over 2,300 nails a day individually when they exerted themselves. The making of a nail is not a a simple operation. forges every part of the nail. He changes his tools when forging the head. The making of a pin or a metal button has much simpler divisions of labour. A person who does them solely usually has much greater dexterity. The speed of some of those manufacturing operations is beyond what ordinary human hands can do. I.1.7 Secondly, the advantage which is gained by saving the time commonly lost in passing from one sort of work to another, is much greater than we should at first view be apt to imagine it. It is impossible to pass very quickly from one kind of work to another; that is carried on in a different place, and with quite different tools. from the field to his loom. When the two trades are done in the same workhouse, the loss of time is much less. However, it is still very considerable. A man commonly saunters a little in turning his hand from one employment to another. When he first begins the new work he is seldom very keen and hearty. As they say, his mind does not go to it. He rather trifles for some time. incapable of any vigorous application. Independent of his dexterity, this cause alone always considerably reduces the amount of work which he can do. I.1.8 Thirdly, proper machinery facilitates and abridges labour. It is unnecessary to give any example. The invention of all those machines came from the division of labour. People are much more likely to discover easier methods of attaining any object, when their whole attention is directed towards that single object, than when it is dissipated among various things. Because of the division of labour, a man’s entire attention comes directed towards some very simple object. He naturally finds easier methods of performing his work. Many of the machines, used in those manufactures with the most division of labour, were originally the inventions of common workers. Those workers were employed in some very simple operation. They naturally thought to find out easier methods of performing it. There are very pretty machines, which were invented by such workers in order to facilitate and quicken their own work. In the first steam engines, a boy was constantly employed to open and shut alternately the communication between the boiler and the cylinder, depending on the stroke of the piston. One of those boys loved to play with his companions. He observed that by tying a string from the handle of the valve which opened this communication, to another part of the machine, the valve would open and shut without his assistance, and allow him to be with his play-fellows. One of the greatest improvements on this early machine was from that boy who wanted to save his own labour. I.1.9 However, all the improvements in machinery were not the inventions of those who used the machines. Many improvements were from the ingenuity of the makers of the machines, when making them became their business. Some were made by philosophers or men of speculation. Their job is to do nothing except observe everything. They often can combine the powers of the most distant and dissimilar objects. In the progress of society, philosophy or speculation becomes, like every other employment, the principal trade and occupation of a particular class of citizens. It is also subdivided into many branches. Each branch affords occupation to a peculiar class of philosophers. This subdivision improves dexterity and saves time. More work is done on the whole. The amount of science is increased by it. I.1.10 The division of labour greatly increases productivity. This productivity in a well-governed society creates the universal opulence which extends to the poor. Every worker has a lot of his own work to dispose of beyond what he himself needs. They all are able to exchange their own goods. The worker supplies other workers abundantly with what they need. They accommodate him as amply with what he needs. A general plenty diffuses itself through the society. I.1.11The accommodation of a common day-labourer in a civilized country involves a small part of the industry of so many people. For example, the labourer’s woollen coat is coarse and rough. These must all join their arts to complete the coat. many merchants and carriers to transport the materials from those workers to others who often live very far! the drugs used by the dyer, which often come from the remotest corners of the world! the tools of the meanest of those workers! must all of them join their different arts in order to produce them. the coals which he uses. These northern parts of the world would not be very comfortable without them. the tools of all the workers employed in producing those different conveniencies. The production of all these things require the cooperation of many thousands. Without these, the very meanest person in a civilized country could not be provided his accommodations. These accommodations falsely seem to be produced in an easy and simple way. These may appear extremely simple and easy compared to the more extravagant luxury of the great. A European prince’s accommodation does not always so much exceed that of an industrious and frugal peasant. But the peasant’s accommodation exceeds the accommodation of many African kings. Those kings are absolute masters of the lives of 10,000 naked savages. Highly benefitted by this ,too helpful and saves time ,has removed complexities.